Spending Christmas will not be complete unless a home has Holiday Outdoor string lights on its backyard. While every one of you out there looks forward to hanging these lights in your gardens, you must also consider the safety hazards that are often attached to it. You better review tips on how to use your Christmas lights safely. What you should do when a bulb from the entire lighting system burns out. Dried tree branches from your backyard may affect the safety of the holiday lights. Read instructions first before installing the Christmas lights. You will find this in the package. Pay attention to your extension cords as well. Determine whether it is time to replace old holiday Christmas lights or not. What to do with burning bulbs? 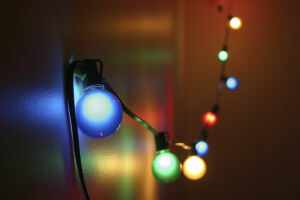 Even a single burning bulb to the Christmas lights will affect the safety of the lighting system. This can be a fire hazard. If you find out that one of your bulbs have burnt, replace it immediately. What about dry tree branches where your holiday string lights hang? The dryness of the tree can lead to possible flame hazards. Get rid of the flame. Ensure that your trees get the appropriate amount of water each day. If you concentrate much of your time reading product literature for your prescription drugs or cosmetics, do the same with your Christmas light acquisition. This is your best tool to make sure that the lights will work for your utmost safety. If you are buying your holiday string lights from a local store, it would be better if you read the label first before buying them. As an alternative, ask the store assistant to help you learn more facts about the light you are buying. Alright, you have checked your Christmas lights to assure that they do work for your safety. But, aside from that, you must look into your extension cords as well. Just like your Christmas lights, they may be fire or flame hazards. Specifically check on the durability of the wire coverings. You are not obliged to replace your Christmas lights every year. As long as they still function, you may use them for another year or two. But if you feel that it is no longer safe for this year’s celebration, go and replace your holiday string lights with newer ones. This may mean more cost but what is that cost compared to the assured safety of the entire household? Once you follow these five tips, there is no reason to worry about enjoying your holiday string lights. Go on with your usual celebration and spend a peaceful and harmless Christmas with the rest of your family and loved ones.